The flaws in the Minnesota Public Utilities Commission’s (PUC’s) decision to approve the new Enbridge Line 3 crude oil pipeline are becoming more and more apparent. The latest is the PUC buying into Enbridge’s last-minute promise to have adequate insurance to cover a major oil spill. According to the Minnesota Department of Commerce, Enbridge’s oil spill insurance coverage is not only inadequate for a new Line 3, it appears inadequate for Enbridge’s entire mainline system through northern Minnesota. The PUC made a rushed decision on Enbridge Line 3. It allowed Enbridge to make last-minute changes to its proposal, including a promise to have adequate insurance coverage to clean up a major oil spill. The PUC allowed Enbridge to add these new promises after the public hearing record officially closed. The PUC accepted draft promises without giving regulatory agencies or the public time to comment. The PUC trusted Enbridge to fill in the details around its promises after it voted to approve the project. Comment: This is an important new development and raises major questions outside of Line 3. Commerce is saying that not only is Enbridge’s insurance inadequate to cover a major spill from a new Line 3, but it suggests that the oil spill insurance coverage for Enbridge’s entire mainline system through Minnesota is inadequate. The PUC needs to address this question immediately. 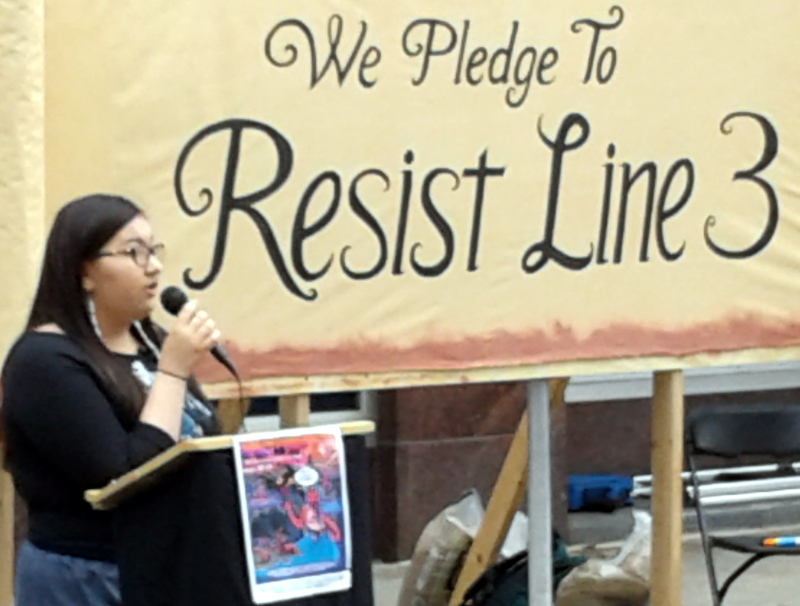 Rose Whipple, one of the Youth Climate Intervenors, spoke against Line 3 at the May Block (Line 3) Party at the PUC. Enbridge filed its official insurance proposal July 16. According to the Department of Commerce, Enbridge’s plan failed to include critical information on its current general liability insurance coverage. Since Enbridge did not offer the information voluntarily, Commerce had to go through the legal motions to compel Enbridge to turn it over. To recap: First, the PUC broke the rules and let Enbridge change its proposal at the last minute. Next, the PUC approved Line 3 assuming Enbridge would provide the details for its last-minute promises. Next, Enbridge omits key insurance information from its proposal. Next, and only after being pressed, does Enbridge provide its insurance information. And, finally, it turns out that Enbridge’s current policy has “significant exclusions for insurance coverage related to damages caused by a crude oil spill.” This is a huge red flag, raising legitimate concerns about Enbridge’s ability and commitment to clean up any future major oil spills in Minnesota.